Hello there! My name is Tiffany, founder of this lovely site, Sweeters Cafe. Before we begin, I would like to wish you all a warm welcome. Here, you will find icons, banners, and requests. All the graphics made here are created with the visitors in mind. My goal for this site is to make sure you have an enjoyable time and provide you with graphics that are to your liking. Please feel free to neomail me if you have any questions/concerns. The small street is as lively as ever as you make your way down it that morning. You pass a group of neopians whispering, Did you hear? Sweeters Cafe is open again! They hurriedly walked away and rounded a corner. You furrow your eyebrows. Sweeters Cafe? Curious, you quickly follow the group. A few minutes later, you arrive at a small cafe with pink a pink terrace. Inside, customers are happily chatting with a young girl and eating. The young girl's eyes lands on you, and excuses herself from the group. Welcome to Sweeters Cafe's soft opening! She said smiling. Please, have a seat and enjoy. She leads you to a small booth in the corner overlooking the street and hands you a menu. Please take your time. HIATUS: From this point on, I will be going on a hiatus. I planned on coming back after my vacation, but one thing led to another, and all of a sudden, school has started again. My classes this semester are more demanding than usual so I am taking a break to focus on my studies. I don't know when I'll be back, but hopefully during the winter. Requests will remain open during my hiatus, but there's no guarantee that they'll be done quickly. As always, feel free to neomail me! Announcement: Entering for ALL competitions at my site, Demure is open so head on over there if you're interested! You do not need to be a site owner in order to participate. It's open to everyone. Plus one new wonderful affiliate, Fleur! I will hopefully add new content this weekend or the next because I have summer finals coming up, so I'll be busy studying for the next couple of days. Announcement: Entering for ALL competitions besides the BAOTM one at my site, Demure is open so head on over there if you're interested! You do not need to be a site owner in order to participate. It's open to everyone. Please always credit when using any of the graphics. A text/button link is fine. If it's more convenient, you can also have the graphic itself link back to the site. Do not redistribute or edit the graphics here in any way. The only graphics that you may edit are the blank bases. Right click, select open in new tab, and copy the address. Right click and select copy image address. After, you can plug the image address into the code below. For a better view of the graphic, drag and drop it into a new tab. Do not redistribute or edit the graphics in any way. For icons, you may request three at the same time. For banners, you may only request one. If you are requesting multiple graphics, please send them all in one neomail. I take requests for both neo-related and non-related graphics. However, make sure that the non-related graphic is appropriate. Please be as descriptive as possible when requesting. I do not want to make something you do not like. Feel free to refer to my portfolio or the content page for examples. If you read the rules, please mention your favorite food somewhere in the form. If you are not satisfied with your request, you get one redo. For your redo, please be sure to specifically state what you want to be changed. Be as detailed as possible. 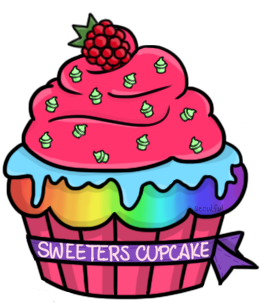 Sweeters Cafe started out as a review site on February 2012. It was a good few years until the site finally closed its doors during October 2017. However, once it closed, I started to think. I missed reviewing and the site community. So, Indulge, a site help & review site was born. But there was something else that was missing. I still was not satisfied. It turned out that I did not just miss reviewing, but Sweeters Cafe itself. So then this version of the site was born. Here, I can still keep Sweeters Cafe open as well as work on graphic making and improve along the way. If you are here for a review, you will not get that here. However, head on over to Indulge and check to see if requests are open if you are in need of one. I hope you enjoy your stay here! During the time Sweeters Cafe was open, it originally had three special cupcakes (rubrics) that were available for order. The Sweeters Cupcake (top of page), Chocolate Delight, and Vanilla Sweetie. However, the menu soon expanded in order to meet more needs. I actually had trouble coming up of a name for my first site before settling on Sweeters Cafe. I didn't want a generic one, so I thought, Why not use a word that is not real? And so, the name, Sweeters Cafe was born. Over the years, Sweeters Cafe was ranked at many sites including Echelon, a popular ranking site a few years back. I did not know a thing about reviewing or coding when I opened a review site. I kind of just wanted one to join the community. However, I gradually improved. During the time it was open, Sweeters Cafe has completed a total of 109 orders (reviews). Do you have something that you would like to see on this site? An idea for a new graphic? New content? Well, this is where you can tell me your thoughts and suggestions. I am always looking for ways on how to improve so I really appreciate all the feedback I can get. If you would like to make a suggestion, just fill out the form and send it in! *Please make the subject: SC Suggestion Name: Suggestion: Anything else?